Just like Dollar and Pound, India has launched new symbol for its ‘Rupee’ currency. We can always type dollar symbol using standard keyboard. Do you want to type and use new Rupee symbol using existing PC keyboard? This can be easily done by downloading new Rupee symbol font on your Windows computer. 2. Then goto C > Windows > Fonts folder to install new font on Windows. User of Window 7 can simply copy and paste font file in ‘Fonts’ folder in ‘Windows’ folder for installation. 3. After installation, open Word processor and then press ~ key at top right (under ESC key). 4. 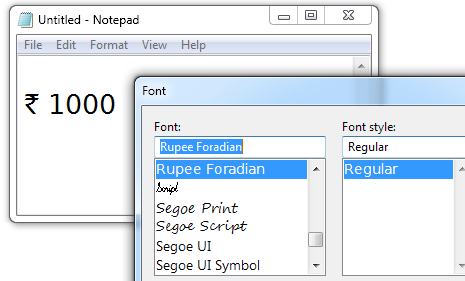 Then select ‘Rupee Foradian font’, this will convert ~ symbol into new Rupee symbol. Quick and easy way of writing new Rupee symbol font on documents, files, images and so on. While sharing Word documents showing new rupee symbol, both sharing PCs must have new Rupee symbol font installed on their respective PCs. how do i get it on my Mac? how to type the Rupee symbol in the word or excel or any other format? Please provide the information with the shortcut like shift+, etc…..